Several of you may be reading this story after yet another eye twitch-inducing trip to Ye Olde Office Vending Machine, whereupon you discovered that even after a long weekend, someone has failed to restock the Doritos. Rolos, of course, remain plentiful, but you don’t want Rolos, goddammit. Meanwhile, as you lament the lack of anything remotely appetizing within your office’s walls, Texas high school students are about to line up for nutritious, trendy food truck lunches right on their school campuses. The injustice of it all. East Texas Matters reports that the Los Fresnos school district is the latest Texas area to invite food trucks to campus as a cafeteria lunch option. The food truck meals are free like the other cafeteria food options, officials tell ETM, and are supposed to get students more excited about eating lunch at school. Los Fresnos follows a few other schools that have begun offering food truck lunches, including ones in Fayette County, Indiana, and Boulder, Colorado. In Pfugerville, Texas, the school’s pioneering food truck lunch program came as a response to crowded conditions in the cafeteria. The customizable tacos and rice choices, provided by Aramark through the Talon Taco Co. (named for the school’s mascot), have been a hit with students, Food Service Director reports, and have led to an overall bump in school lunch orders. 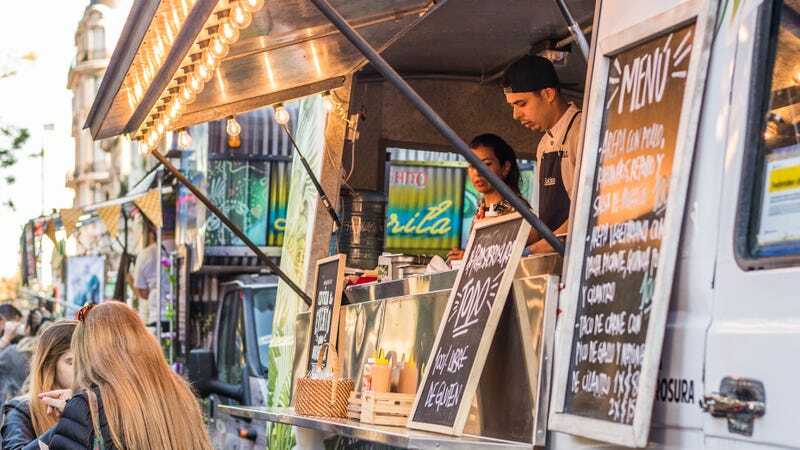 All meals still fall within federal school-lunch guidelines, but borrowing a bit of food trucks’ cool factor makes them more attractive to students. At the end of the day, yeah, it’s still Aramark food, but kids are probably more likely to opt for a cilantro-rice-veggie bowl from the food truck than a serving of mystery meatloaf and creamed corn from the cafeteria. Anything that can get students eating a balanced lunch—shown to improve academic performance—seems like a win. Oh, speaking of winning, can we please get someone to restock the office chips?